These fabrics arrived on the weekend: fabrics from Northcott's Canadian Sesquicentennial collection. As you can imagine these are not in high demand in Iowa, so I sent my sister-in-law in Canada a shopping list. Thank you! I have a plan. When I was thinking about how to represent Canada, I thought about various symbols of provinces, and historic events, and roots. In the end I realized I couldn't possibly include everyone and everything in one quilt and I really didn't want to leave anyone or anything out. Then it occurred to me that the flag represents it all: the people, the history, the landscape. When I think of the flag, of course I think of the iconic red maple leaf. The maple leaf represents all Canadians, no matter our backgrounds and where we live, so I ran with the maple leaf theme. I hope it translates well from this printed size to a throw quilt size! I also plan to applique "150" inside the large leaf and maybe quilt province and territory names somewhere on the quilt. So, does anyone want to sew along? Oh, that is beautiful! If I wasn't already swamped making things for my Mom and siblings from my Dad's shirts, I would be tempted to make it for my MIL. She is from Southern Alberta and her only surviving brother and sister (out of 9 or 10 kids) still live there. It is a wonderful design! I guess I won't need to do that sew along, but I will enjoy watching what you do. I know you will make it wonderful! ---"Love"
That's a fabulous design to mark the Sesquiecentenary of Canada and lovely fabric too. oh, looks neat! I'll be interested to see how it works out. Beautiful design and the fabrics are gorgeous! Have fun putting that wonderful quilt together. Love the design! I like the idea of quilting the names of the provinces in the background. I have always loved the Canadian flag with the maple leaf on it! The fabrics are perfect for the celebration! 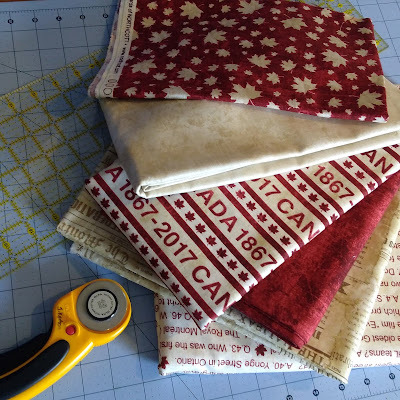 I live in WY, but have friends in Canada so I have direct ordered some of these fabrics. They are Stonehenge fabrics and so nice! 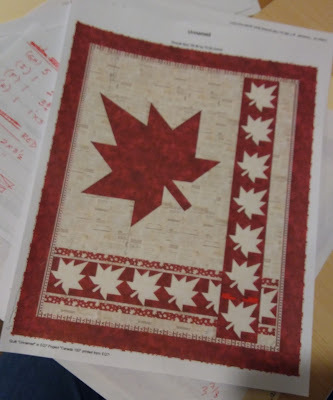 I am still on the hunt for some Mountie fabric I saw in someones 150 Canadian quilt blocks, can't seem to know where to get it, saw it in 3 diff colorways. Help?? Hi Vickie Lewis ... We're glad to "adopt" you to the Canadian fold! There was a print with a Mountie on horseback in the Northcott/Stonehenge Oh Canada line from a few years ago. But I don't recall it in different colorways, so you do have me curious as to what it may be! This is a terrific design, Joanne! I htink I have some of those fabrics (I'm meeting up with my friend tomorrow so I'll know then, can't remember what I ordered!) I mmmmightttt join in. Got so much going on with my own maple leaf à la Spring fling feel quilt along that starts right away! What a beautiful pattern and gorgeous fabrics. It's going to be stunning! This Canuck is very interested in this as a 150th project! Look forward to hearing/seeing more details. It will all depend on the timing for the sew along, but I will sure be trying to be part of this journey. Beautiful design. Will love watching you make this one. QuiltE sent me a link to this post and it interests me as well, here in BC. I have quite a few of the older Northcott Oh Canada fabrics that would work well and will likely be buying some of the new as well. Kind of depends on how long the quilt-along is, how intense and when. I'm looking forward to more info. Hi Joanne, did you want to link-up this post on the Celebrate-Fêtons 150? It sure fits in and we'll be watching to see what you make with the fabrics! I would enjoy sewing along, too. I am hoping that my life will slow down a little, soon. I'm interested in this sealong at the plan?